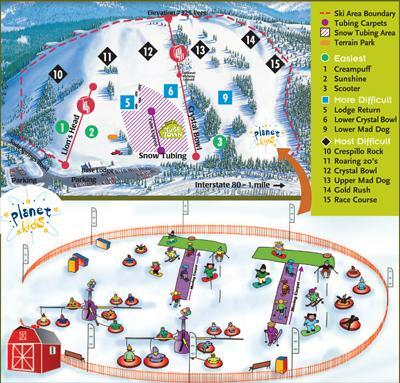 Features: Soda Springs Ski Resort is a perfect place for children to learn how to ski and snowboard. The slopes are less steeply angled so that you can master the basics of your chosen snow sport. Why We Go: Soda Springs Ski Resort caters to families with children. When you're just starting to learn snowboarding and skiing, a snow park like this can make you feel comfortable enough to try new things. The Atmosphere: This snow park feels very inviting and private thanks to its smaller size. The super friendly staff also want kids and parents to feel encouraged as they learn how to snowboard and ski. The Activities: The whole family can take skiing and snowboarding lessons at Soda Springs Ski Resort. Packages differ based on ages, and visitors can also take private lessons. The Prices: Grown ups can get lift tickets here for only $36. For kids, lift tickets cost $25. These delightfully affordable prices make many families happy. Inside Knowledge: Children between the ages of 6 and 12 can take the driver's seat on mini snowmobiles! Young guests at Soda Springs Ski Resort love cruising around the circular track while their parents cheer them on. Do Dress Warmly: You and your mini-me's will want to bundle up to stay warm. Wear a warm beanie, and stay dry in a waterproof jacket, waterproof pants, and waterproof gloves. Shade your eyes in snow goggles, and keep your little piggies protected in snow boots. Do Bring Your Group: Come to Soda Springs Ski Resort in a group of at least 20 people and enjoy discounted rates during your visit. Don't Tire Yourself Out: To get to the Planet Kids area of the Soda Springs Ski Resort, all you need to do is hop onto a sleigh that will take you there. Why walk when you can go on a sleigh ride? Don't Think Snowmobiling Is Only For Grown Ups: The kids will love being able to steer their own snowmobiles around the circular track. All kids are given helmets to wear so that their noggins are protected. Ski Soda Springs is the most kid-friendly snow park in Lake Tahoe. Soda Springs Ski Resort features Tube Town, a place for grown ups and children alike to go careening down the mountain in snow tubes. Soda Springs Tahoe is all about the youngsters at Planet Kids, where they can learn to ski and snowboard. Soda Springs Winter Resort will help you go from "beginner" to "big shot" on the slopes. Learn how to maneuver your skis so that you can get yourself where you want to go on the snow. You can also learn the modern sport of snowboarding at Soda Springs Tahoe. Strap your feet onto your board and learn how to take off down the slopes while controlling your balance, direction, and speed. Soda Springs Ski Resort keeps kids and kids at heart happy in a fun area called Tube Town. Take a seat in a snow tube and get ready for take-off! As soon as you start sliding down the hill, you'll pick up speed and soon be rushing to the bottom in a flurry of snow. Your fun ride down the hill will have you scrambling back up the hill to do it all again. Head to the Planet Kids area where youngsters can learn how to ski and snowboard. Get ready for your fun mountain activities by getting the proper equipment. If skiing is your sport of choice for the day, you can get skis, boots and poles sized for both children and adults. If snowboarding is calling your name, you can get snowboards and boots to do so here too. Keep your head snug and secure in a helmet.